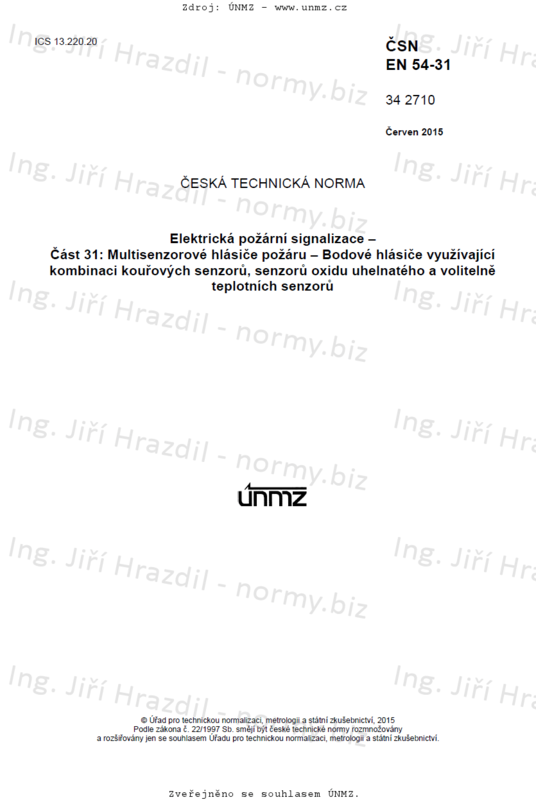 This European Standard specifies requirements, test methods and performance criteria for point-type multi-sensor fire detectors for use in fire detection and fire alarm systems installed in and around buildings (see EN 54-1:2011), incorporating in one mechanical enclosure at least one optical or ionization smoke sensor and at least one carbon monoxide (CO) sensor and optionally one or more heat sensors, utilizing the combination of the detected phenomena. This European Standard covers only modes of operation, where at least the signals of both smoke and carbon monoxide sensors are continuously evaluated. This European Standard provides for the assessment and verification of constancy of performance (AVCP) of point detectors using a combination of smoke, carbon monoxide and optionally heat sensors to this EN. Point detectors using a combination of smoke, carbon monoxide and optionally heat sensors, which are having special characteristics suitable for the detection of specific fire risks are not covered by this European Standard. The performance requirements for any additional functions are beyond the scope of this standard (e.g. additional features or enhanced functionality for which this European Standard does not define a test or assessment method).